Q. Where would I find help on a research paper with comparing/contrasting characters in a book? A valuable resource for comparing characters in a story is the database Literature Resource Center. To access the list of databases, go to the LRC homepage and click on Databases, or click here. You will see a list of databases. 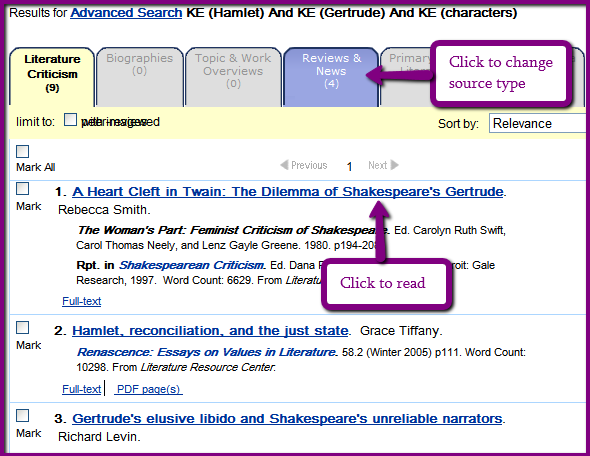 Scroll down to Literature Resource Center and select it. If you are off campus, you will need to put in a username and a password. Your username is your 7-digit TCL ID. Your password is your first initial of your first name followed by the last three digits of your social security number. In the three rows select “keyword." Type the names of the characters in the boxes. You may also want to type in a term like "characters." Click "Search."